For almost ten years I have lived in a rental. During this time and with every rental we lived in, I strived to make it my heaven on earth. I decorated it, I created make-shifts this and thats, and painted walls. 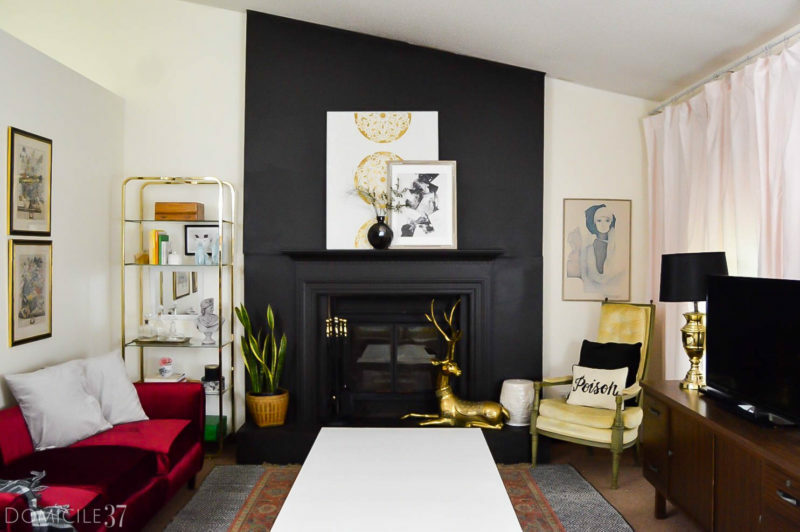 Although, I am now living in our first home of our own, I could not resist the urge to jump in and participate in The Best Renters’ Hack series hosted my dear friend Kathryn from Up To Date Interiors. Check her out, she make rental living look like a dream. 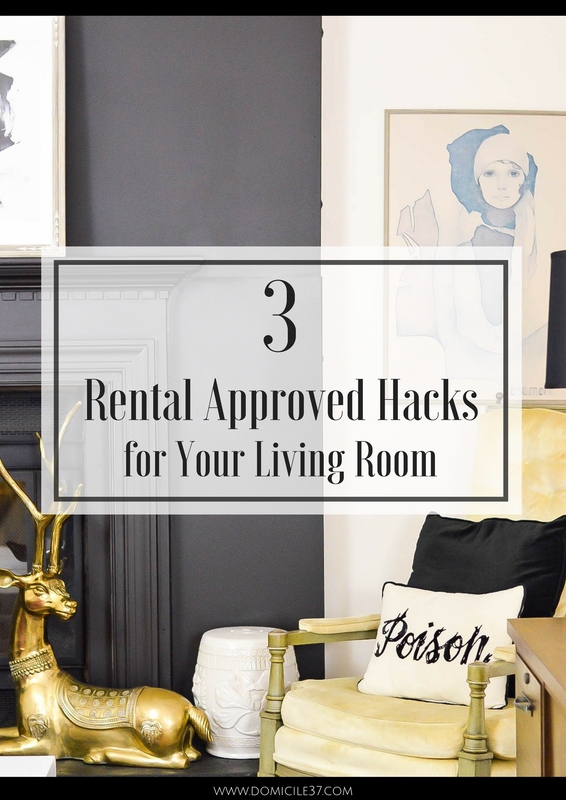 Anyhow, we were asked to share our favorite rental hacks for the living room that we have done in our own rental. I can think of three of my absolute favorite hacks for rental living that made my space come together as a whole and was aesthetically pleasing to the eye. 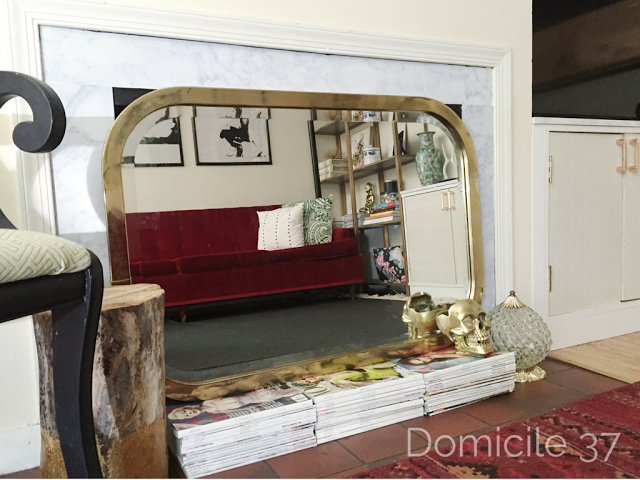 The first project was my DIY faux fireplace that I did for the Spring 2016 One Room Challenge. You can check that out, HERE. This will take a lot for me to explain the concept, so reverting back to the original post will be best. Just for general knowledge, this fireplace was just created for looks. 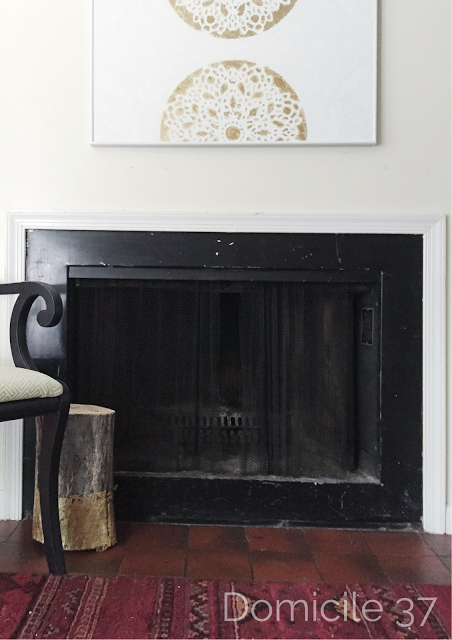 The mister and I have never used any of the fireplaces in our rental, so this concept worked perfectly. We built this fireplace surround to go up into two large pieces for easy take down. We took this down without a hitch and all we had to do was fill in the holes from the screws. I am telling you, I am a genius! How is that for a before pic? Last but surely not forgotten, I created a make-shift built in cabinet to house our dvd’s, games, and family photos. It also doubled as a tv stand. When we lived in the townhouse we had this weird niche next to where our fireplace stuck out and it was exposed to the railing on the stairs. I always thought that this was a great place to put the tv. One day while at habitat for humanity I found a five dollar shelf and printer stand so, I purchased both. I turned the tall shelf sideways and the rest is history. I used thrifted hardware and wood from Habitat so I would not over spend. I purchased a nice plywood birch sheet from my local hardware store to use as a cabinet doors and as the cabinet top of the entertainment stand. I covered the pieces that sat on top of the stand with marble contact paper to create a more sleek look. No wood went unused in this diy. I also created a filler so it looked like it was built in. 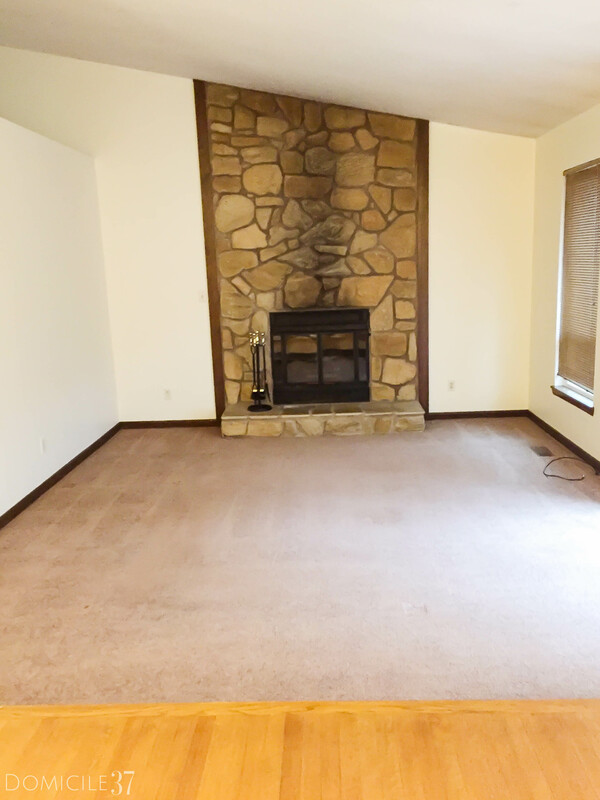 For more information and high quality images of this wonderful space (LOL), click HERE. 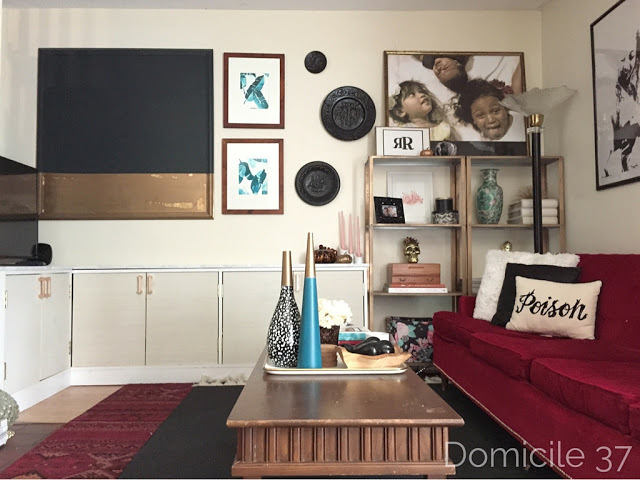 Hope you enjoyed my 3 rental approved hacks for the living room and I hope you were inspired to create. 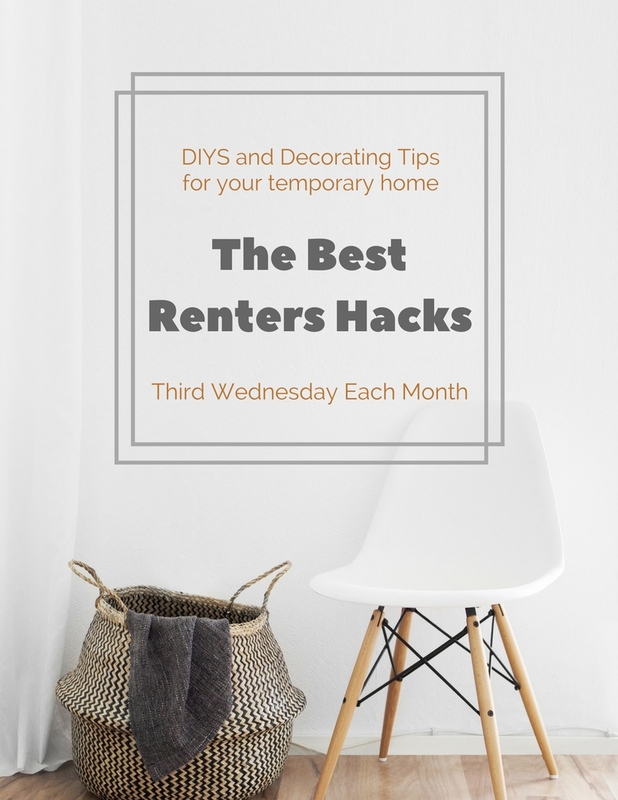 See you next month for another one of the The Best Renter Hacks! I am pretty sure they are making magic happen in their rentals! If you like this post, PIN IT! Love love your black wall! Well these are amazing, love your style and great tips! Absolutely love the fireplace Jess! I love how unique and bold your rental tips are Jess! I think sometimes we just need to go for it. 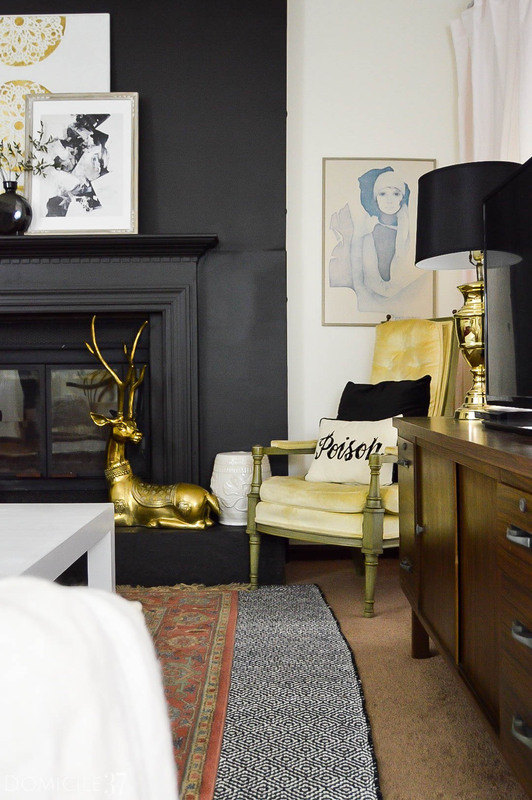 Thank you so much for sharing your amazing rental hacks! Thank you and Thank you of hosting! Jess, that black fireplace is fantastic!!! I can’t believe that was a renter friendly DIY *bows down*. And the “built-ins” so clever. By the way, I’ve been on the hunt for a similar brass deer for years, so whenever you’re ready to get rid of that one hit me up LOL. Haha! I would end up paying a fortune to ship it. It is extremely heavy. Haha, but thanks! What great ideas! I love everything you created to make your home look stunning!